Summer is fully underway! Nothing says summer like bringing the outdoors in, especially when you are at the beach. If you don’t live close to the beach, why not bring it home? If you do live near the beach, why not bring it home?! Decorating with white sandy beaches in mind can add calm and relaxation to any room. Here are a few Beach Inspired Design Ideas. One of the first things I think about when summer rolls along is the Fourth of July. Get patriotic and decorate in subtle tones of red, white, and blue. You don’t have to go bold! Consider lighter hues as well. Arrange a collection of seashells or sand from your travels in a jar or vase and use it as a centerpiece. Label the jar with your vacation destination and date on a tag with twine to add a personal touch. 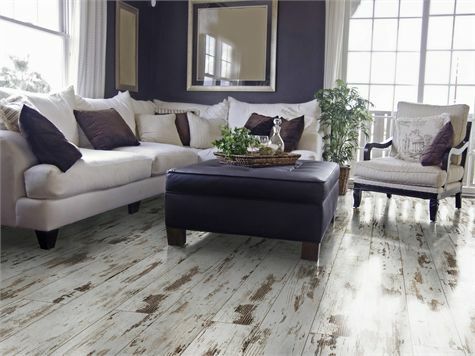 Arguably, white may not be a “color”, however look at this beautiful white washed oak laminate flooring. It adds style, character, and personality to a room and makes an elegant statement. Rustic and romantic, this room screams (well, whispers) relaxation. 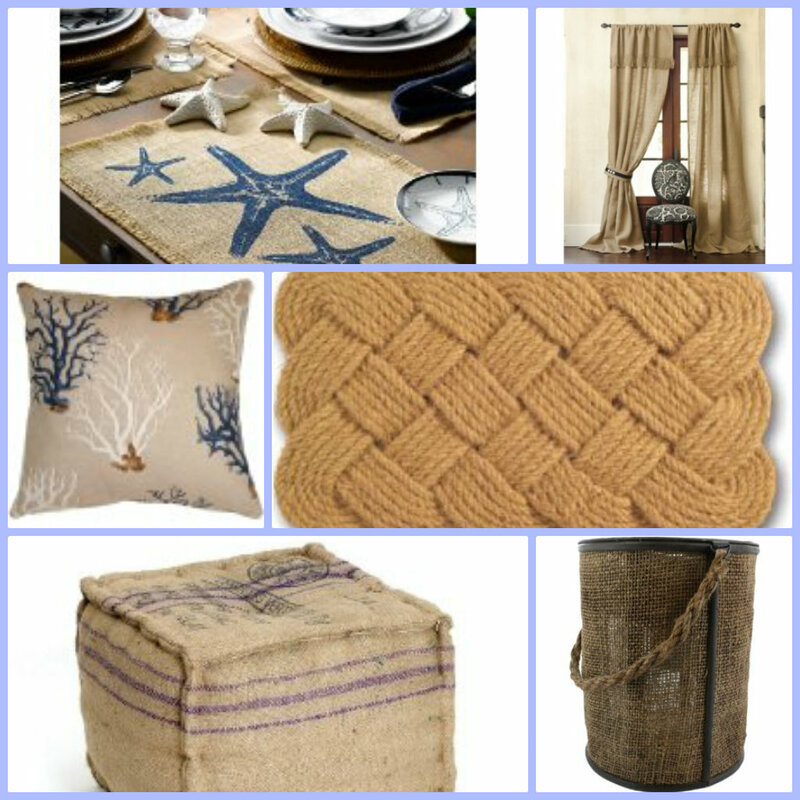 I love projects using natural fibers like, sisal, burlap, jute, and rope. It’s eco-friendly, chic, and inexpensive. What more could you want? It also goes with several types of décor styles from industrial to rustic and from nautical to French country. Burlap can be purchased at fabric stores for less than three dollars a yard. OK, I’m all for theme parties but taking a theme into your home can be done tastefully and with grace. The kitschy look can be avoided. 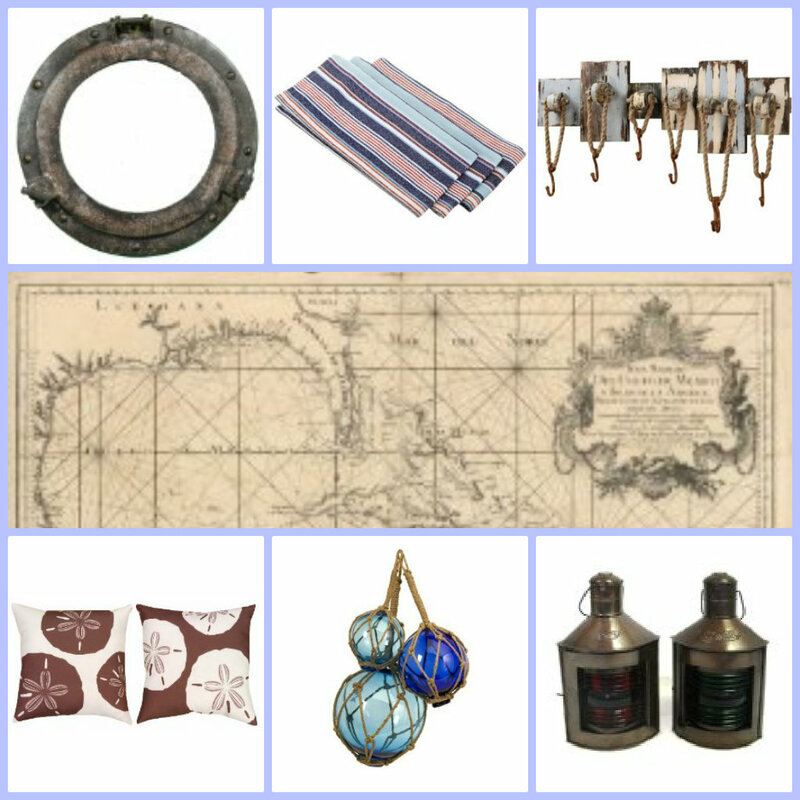 Here are some nautical themed accent pieces where I don’t think you can go wrong. My favorite is the map. You can never go wrong with a beautifully framed map! Love these theme ideas, especially the glass jars. So pretty. So pretty! My favorite is that ottoman. I would love to do those floors too. I wish! I love that ottoman too! Those floors ARE pretty amazing! Thank you for stopping by! great style! so relaxing and calm.